Click this image to enlarge. Kinosaki does not only have delicious cuisine, it is also known as a place with excellent local brewery due to the high-quality water the area has to offer. 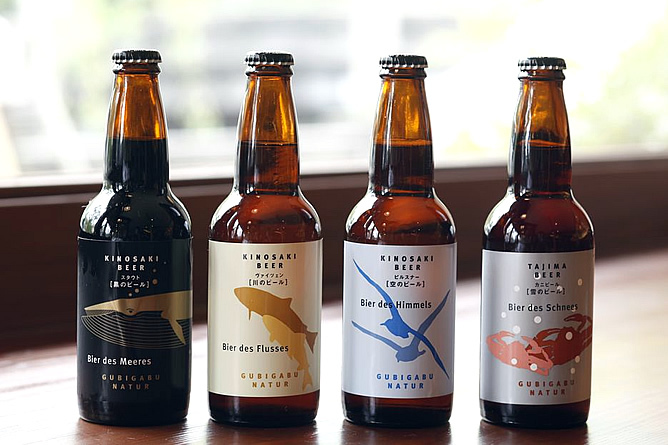 In search for a local beer that goes well with the local specialties crab and Tajima beef, four types of beer have been developed at the beer restaurant GUBIGABU. There are a stout, a pilsner and a wheat beer on offer. The most interesting and unique brand, however, is the “crab beer”, which also carries the name “Yuki-no-biiru” (Eng: snow beer). This slightly sweet beer has high malt content and a slightly higher alcohol content of 6% and has been distinctively brewed to fit the taste of Takeno crabs.